This is a new find and suggests that the 1st class might also be out there. 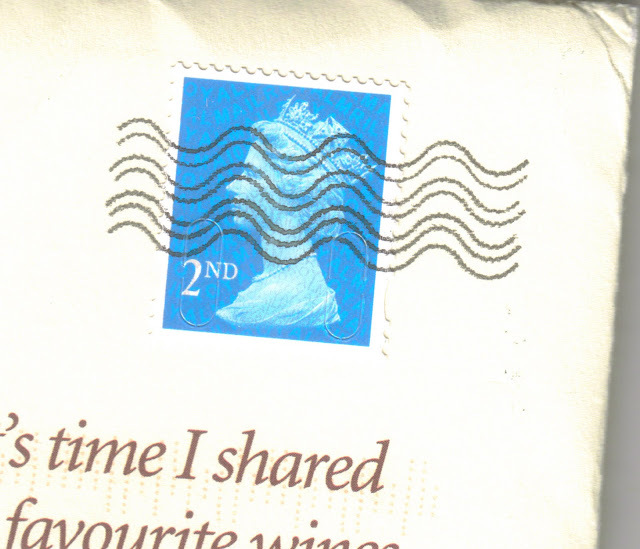 We have reason to believe, from information supplied by Royal Mail, that the 2011 versions also exist. However, we have no way of knowing whether the part of Royal Mail which supplies these to the mailing houses has yet sold, or even received, any of the 2011 versions - which have been produced for both 1st & 2nd class values. Let us know if you find any of these - and if you received them on mail then information about the sender and mailing house would be useful! I had the same mailshot as illustrated here, with the same MRIL MA10 stamp. Not mentioned in the post but it's from the Sunday Times Wine Club mailing dated 13 July 2011. Thanks Rob. I can see the STWC gaining more members just for the stamps! Now I wonder who has the 1st class, and when the 2011 version (which we know has been printed) will actually be used.